St. Clairsville’s Dustin Carrothers makes contact with the ball during Wednesday’s Buckeye 8 encounter against Bellaire at Memorial Park. Carrothers batted twice during a six-run sixth inning as the Red Devils prevailed, 12-5, clinching the Buckeye 8 South crown. 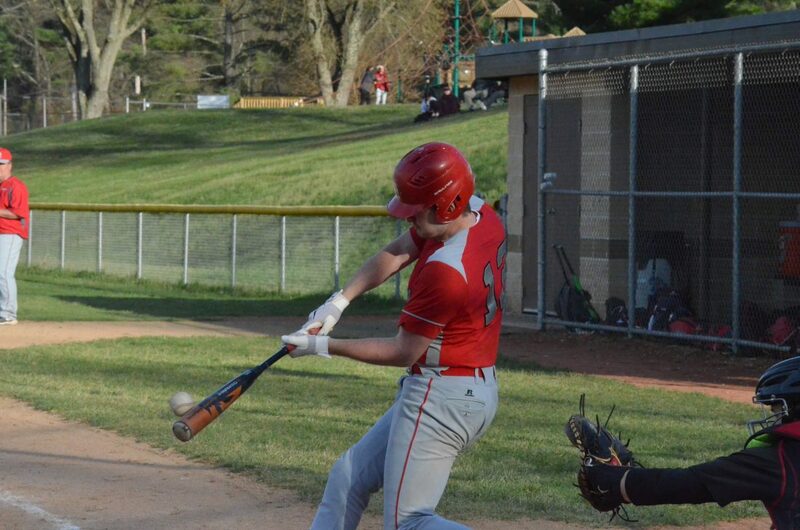 ST. CLAIRSVILLE — The top of the fifth inning of Wednesday’s Buckeye 8 baseball tilt between Bellaire and St. Clairsville was a source of pride for the Red Devils and a source of frustration for the Big Reds. Bellaire trailed by one heading into the frame, but loaded the bases with two outs. St. Clairsville, however, stymied the threat, then exploded for six runs in the home half of the inning en route to a convincing 12-5 triumph, one that secured another South Division title for Head Coach Tom Sliva’s club. The Red Devils did a lot in winning for the seventh time in 12 tries, but what pleased Sliva the most was his team’s never-say-die attitude. One day after being mercy-ruled at Wheeling Park, St. Clairsville watched Bellaire bat around in the first, scoring five runs in the process and grabbing momentum before a Red Devil could step to the plate. Still, Sliva wasn’t overly concerned. That’s what the Red Devils did, starting right away in the first. The first three St. C. batters reached, before catcher Jakob Jarvis delivered the big blow. “His two-out, two-run single was huge,” Sliva said of the blast that plated Matthew Busby and Will Balgo. “That took a bit of air out of them and put a little bit of momentum in our dugout. The Red Devils came back with three more runs in the second to tie the game at 5-5. Balgo belted a 2-run double that tied the game, following up Storer’s RBI single. Then, in the fourth, the Red Devils took the lead for good when John Luke DeFilippo scored on a fielder’s choice. In the meantime, Storer stood strong on the hill, limiting the Big Reds to three hits between innings two through four — just like his coach predicted. Storer, who finished with seven Ks and no walks, ran into trouble in the fifth. Mason Badia reached second to start the inning on a single and error. Trenton Wilson then reached safely on a bunt, allowing Badia to move to third. With one down, Hunter Boyd hit a comebacker to Storer. He immediately rifled the ball home, getting Badia for out No. 2. Cody Albaugh singled, loading the bases before Storer got leadoff batter Bobby Roth to ground out to short ending the inning. The Big Reds (2-9) had seven hits in the first, with Quentin Baker driving in two runs and Wilson and Boyd each knocking in one. But after that, Bellaire was stymied. “We came out swinging and held our own,” Bellaire head coach John Patrone admitted. “Out of the 14 innings we’ve played them this week, 12 have been good ones. (Monday) it was 2-2 going into the seventh and that had a (5-run) inning. “At some point we need to get over the hump and start winning some games. St. Clairsville batted around in the bottom of the fifth to put the game away. Five players recorded RBIs on just two hits.